Sometimes I paint from personal experience and sometimes I paint and then experience and that is what happened here. Some artists that I know hate doing commissions, I feel the opposite entirely, and I love doing them. I think it is because it makes me take a look at a subject that I may not have painted otherwise and I strive to please the client, however I have been very lucky and most of the time get just guide lines and then my imagination can roam free. The hard part is that you have to research the subject matter, but at the same time you then acquire knowledge and you never know where that can lead to. 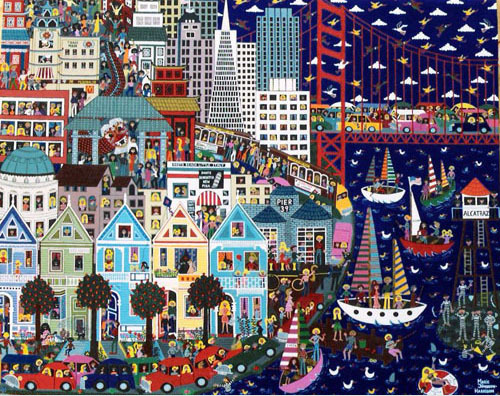 This painting of San Francisco was a commission again for my US gallery and ended up being bought by an interior designer. I had so much fun pouring through travel books and coffee books on SF, that I felt I had really been there, and finally last year we went. Our daughter went to Ecuador, son flew in from London and went to San Diego (we were to meet up later in LA) and me and Bryan hired a car for the drive from LA to SF. What we did not realize was that it was the Thanksgiving Weekend which is the busiest time of the entire year on the roads! So what should have been a 5-6 hour trip took us more than 12 to complete. It was amazing to me that we got there in one piece as the multi lane highway is very scary not to mention they drive on the opposite side of the road, luckily Bryan felt confident to drive (and had been there and done that before anyway) I on the other hand nearly held my breath the whole way and almost relished the traffic jams so that I could rest a bit. All experiences find their way into my art blogs or paintings in one way or another! Anyway we finally arrived in San Francisco but then were unable to find our hotel, so after a lot of map looking and going on and off the freeway, we decided to ask in a liquor shop for directions (the idea being; get a bottle of wine for the hotel room and some takeaway Thai as now it was nearly 10pm and too late for a hotel dinner). Bryan went in and I stayed in the car, but it wasn’t long before I realized this may just be the seedy part of SF as I had a passing parade of girls in miniskirts and people decidedly worse for wear walking past. I tried to busy myself in the car (trying not to make eye contact) paying great attention to the contents of a rather boring handbag. I was getting a bit worried I may soon get a job offer from some unsavoury characters and besides that there were 2 fellows drinking out of paper bags right outside the liquor shop were Bryan was. I was trying to call Bryans mobile as 25 minutes had passed by and I couldn’t go looking for him (might get dragged into a dark alley lol) but that did me little good as his phone rang beside me on his seat! Thought at this stage maybe Bryan had been pulled into a dark alley himself, however when he finally got back to the car, he also had a long tale to tell, with a handful of directions on several bits of paper. The funny thing is that all of those directions differed from each other, the store keeper gave one version as did his wife, then a customer had called his wife as she worked close to the Hotel, and someone else said that was not right and gave another version. Finally a totally legless man had come in and said they were all wrong and given his version. Would you believe the very drunk mans directions were spot on, and the others did not have a clue, as it happens!